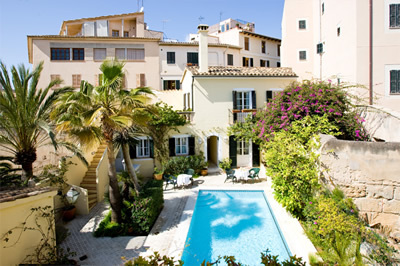 This gorgeous Hotel full of classy mediteranean styling, local textiles & tiling is set looking on to the little square of Plaza Cort with a 1000 year old olive tree as it's centre... featuring the hotel's restaurant & cafe's open air terrace serving a-la-carte breakfast, tapas, lunch, dinner and oyster bar. 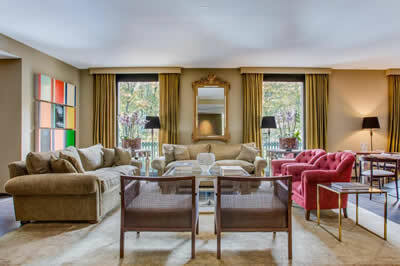 Each individually stylish room features a seating area,TV, minibar, bathrobe, free Wi-Fi. 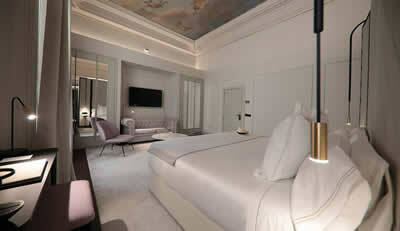 The spacious rooms feature satellite TV, WiFi, king-size beds. 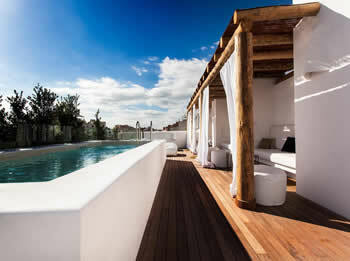 The hotel has a Spa, located on a sun terrace, featuring a plunge pool and hot tub. Private parking & Airport shuttle. 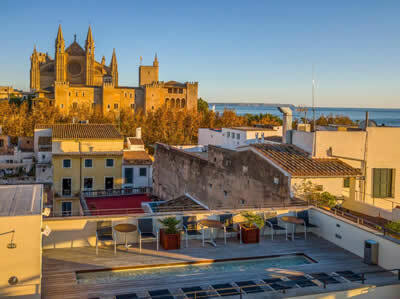 Beautifully converted from a 17th century old monastery, Convent de la Missió is a modern chic hotel in an excellent location in the centre of historic Palma Old Town with a stunning roof terrace and pool, indoor pool and spa. 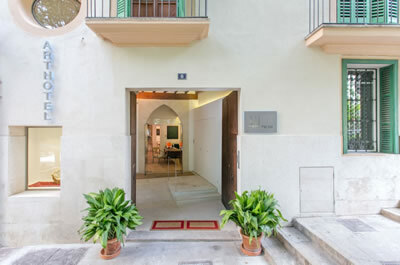 The Hotel Tres boasts an unbeatable location at the heart of the historical centre of Palma. 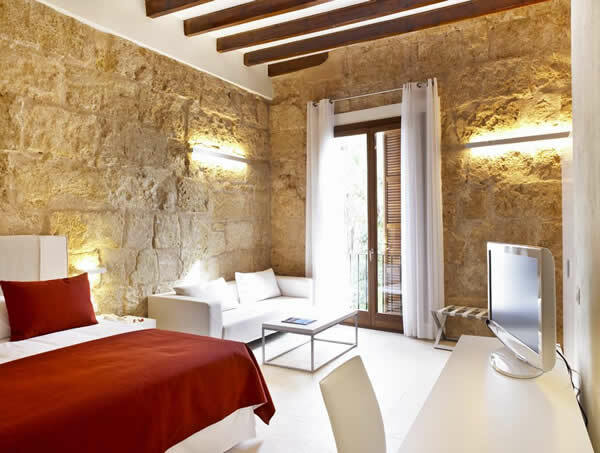 Housed in a former palace dating from the 16th century, the Hotel Tres combines stylish contemporary interiors with traditional Majorcan decor. 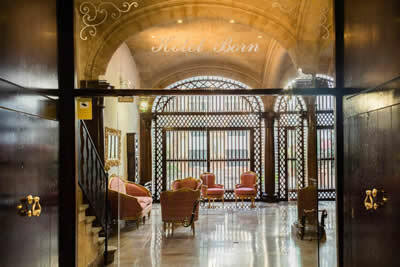 Can Cera Hotel is a converted 17th-century palace in the historic Palma Old Town with a sauna & spa, pretty terrace and courtyard. 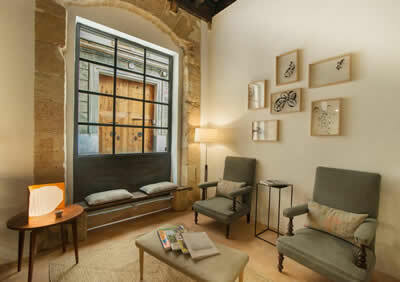 The airy rooms have antique-style furniture, minibar and flat-screen satellite TV & free Wifi. 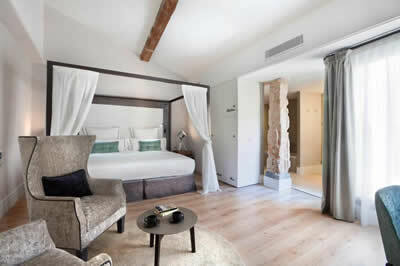 This boutique hotel is set in a traditional Majorcan manor house with an outdoor swimming pool. 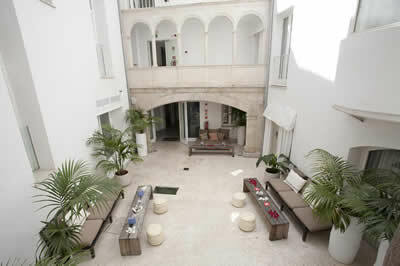 It features spacious and classically decorated rooms, a bar, mini gym and small outdoor fitness area. Free Wi-Fi. Adults only. 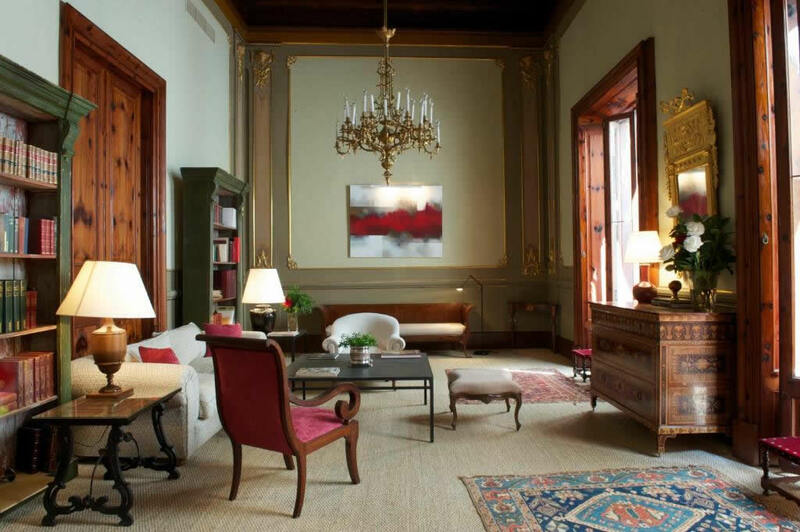 This Small 19th century Palace is a former antique shop, which is evident with its wonderful collection of art and antiques decorating the building throughtout.. situated close to La Rambla and the near by Placa Major it is within walking distance of the main sights. 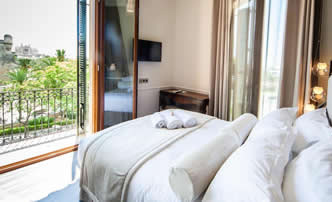 All rooms have a flat-screen TV with satellite channels, a private bathroom equipped with a bath or shower, bath robes and slippers. Free WiFi, bar and a continental breakfast is available in the sunny courtyard. I can't really think of any! A little longer to walk to the bay, but so worth it! 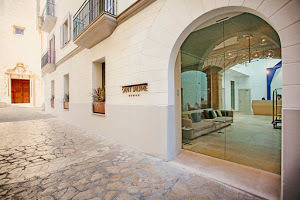 Hotel Palau Sa Font is a converted XVI century palace, hidden amongst the local restaurants, art galleries and old bakeries in the vibrant historic quarter of La Lonja.. A no-fuss, quietly stylish hotel where you will be able to unwind and make the most of your time in Palma..
A beautiful conversion of an historic convent, with city views from the roof top pool and solarium...This cosy boutique hotel features a modern Balearic décor with modern bathrooms with a shower... coffee making facilities. Room service available. 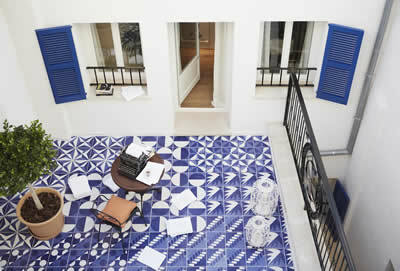 All rooms have an iPad available on request, free Wifi. A-la-carte breakfast with Mediterranean produce, restaurant & bar Rosetó offers a taste of the Mediterranean and Mallorcan cuisine. 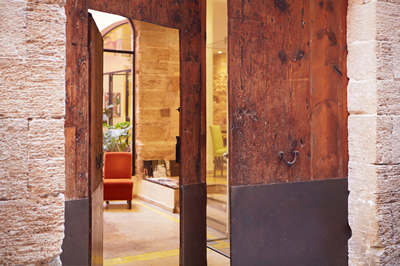 With a lovely peaceful modern garden courtyard in the centre of the city, between La Rambla and the Placa del Mercat, ideal for exploring.. 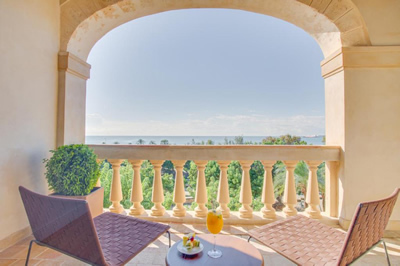 The hotel offers a continental breakfast and guests have a one use discount at the Ritzi Restaurant and Ritzino cocktail bar. A very tranquil location along one of the Old Town's narrow lanes, but just round the corner from all the sights..
5 minutes from a secluded beach.